Probation Officer Mike Rafferty installs a transmitter on an unidentified female offender. A sign on the screen door reads, "Go away and don't come back," but when the probation officers knock, the gray-haired resident eagerly invites them into his small trailer in North Spokane. The officers scan the living room: Birdcages crowd the hallway, an aquarium bubbles in the corner, Seinfeld plays on TV. "You want the grand tour?" the man asks. Probation officers Travis Lindsley and Mike Rafferty each oversee about 30 offenders in the city's Electronic Home Monitoring program. Once a week, they conduct random "field checks" to ensure that participants like this 63-year-old man comply with their court-ordered release conditions. An ankle bracelet prevents him from legally leaving the property. "We'll check the refrigerator first," Rafferty says, opening up the fridge and poking around for any alcohol that might be hidden away. He peers into a couple of nearby cabinets, checking for suspicious bottles or contraband. "Have you been drinking anything?" Lindsley asks. "Yes," the man says. "Milk and juice." 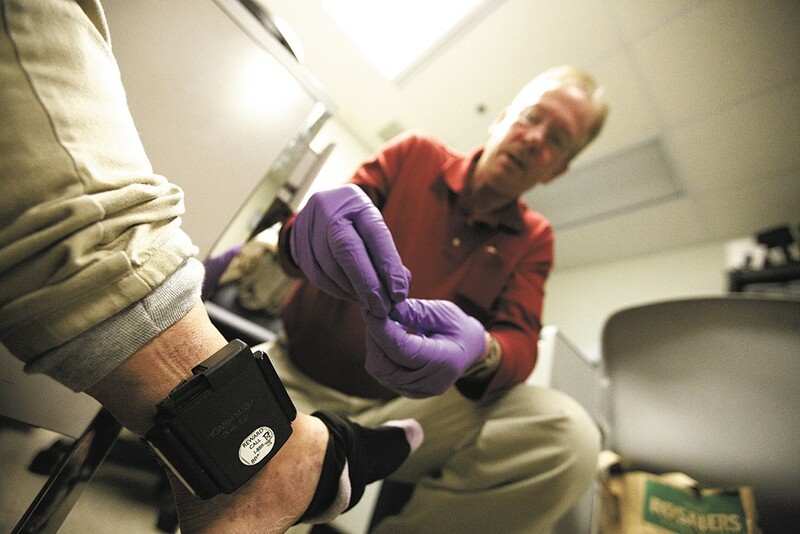 In recent years, court jurisdictions across the country have increasingly turned to electronic home monitoring via GPS ankle bracelets or handheld breathalyzers instead of jail sentences to reduce recidivism and cut expenses. Research shows many benefits to electronic monitoring, and local Smart Justice advocates call it "low-hanging fruit" for improving offender accountability while relieving overcrowded jails. The Spokane Municipal Court expanded its program last year and the Geiger Corrections Center resurrected its program last week after closing it three years ago. Many of these offenders would otherwise face traditional jail sentences, Lindsley says. This man would likely lose his trailer, his disability benefits, Social Security payments and other support structures that help keep him healthy and out of future trouble. "It's been growing," Lindsley says of the program. "We've been getting more and more people. They're pretty happy to be on it, considering what the options are." Donna McBride, chief probation officer for the Municipal Probation Department, says electronic home monitoring has proved an invaluable tool for tracking and managing low-level criminal offenders. She emphasizes that high-risk or violent offenders do not qualify for the city's program, which offers several levels of monitoring for defendants awaiting trial or offenders convicted of gross misdemeanors. "We needed another alternative to incarceration," she says, adding, "[But] it's not a cakewalk by any means." The highest level of monitoring involves a tamper-proof GPS ankle bracelet that records every location in real time, plotting someone's movements on a map. A lower-level option, McBride explains, uses a "radio frequency" anklet to track when someone is home. The devices can be set to allow movement during certain times for work or counseling, but otherwise enforce house arrest. For offenders with restrictions on alcohol, the program also has bracelets with skin sensors that can detect alcohol in the system or mobile breathalyzers that the offender must blow into at random intervals. The breathalyzer also takes a photo during the test to confirm the offender's identity. McBride says the city's four-year-old program now has capacity for 90 offenders. The city expanded the program last year, adding an extra probation officer in hopes of redirecting more low-level offenders out of the jail system and into community-based supervision. Thousands of offenders have since successfully completed the program. "It's a popular program," she says. "It's always full." In the wake of recent recommendations from the Spokane Regional Criminal Justice Commission, the county has also relaunched its similar electronic home monitoring program. Ron Cunningham, a case management coordinator at the Geiger Corrections Center, says he expects the renewed project to serve about 25 offenders, helping provide a more seamless link between jail and release back into the community. Geiger "hooked up" its first participant last Thursday. "Not everybody needs to spend the time in jail," he says, "but they need some accountability. ... It's a great alternative." A 2012 data analysis from the District of Columbia Crime Policy Institute compared results from seven separate research studies on electronic monitoring, finding a 24 percent average reduction in arrests of offenders in such programs compared to traditional probation. The average cost savings per offender amounted to about $580. McBride and Cunningham both touted the potential cost savings to taxpayers, saying the electronic monitoring usually costs about $20 per offender per day, compared to approximately $135 a day to house someone in the county jail. In both programs, participating offenders pick up part of the tab. Officials also emphasized the importance of keeping the option affordable. Some private monitoring vendors, which the county also utilizes, can cost up to $20 a day, plus a $50 initiation fee. If an offender cannot keep up payments, they fail the program and go back to jail. The city program costs offenders about $1 to $5 a day, depending on the type of equipment needed. The new Geiger program costs from $2 to $4.25 a day. "Everybody pays something towards the cost of their incarceration," McBride says. "That is part of the accountability, but nobody pays to the extent that they're going to lose their home." That investment helps motivate participants, she says. They know they are paying for the program, so they want to succeed. They attend their court appearances. They want to follow the rules. McBride says the program has a less than 1 percent rate for new arrests while under electronic monitoring. "They know that it's a privilege, not a right," she says, "so they're inclined to be very compliant." Julie Schaffer, an attorney with the nonprofit Center for Justice, says the structure and discipline help participants develop responsible habits. Offenders can learn to function in a world with strict boundaries and swift consequences. They learn to live without drugs or alcohol. She hopes to see the programs continue to expand. "It really sets people up for success," she says. "I think it's fantastic." Lawanda Sparks, 62, can't say enough good things about the electronic monitoring program. The Spokane woman says she was sentenced last year to spend 12 months on home monitoring for a shoplifting charge. The program let her serve her time while building new, healthy routines. With the help of her city probation officer Johanna Camp, Sparks registered for counseling classes and the driver's relicensing program. "She really believed in me," Sparks says of Camp. In October, Sparks completed the monitoring program after earning four months off for good behavior. She still goes to the classes.